Van Damme et al. 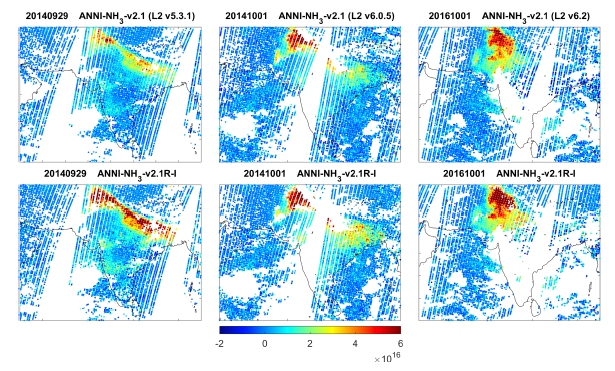 (2017) just published a paper presenting an improved version (v2.1) of the neural-network-based algorithm for retrieving atmospheric ammonia (NH3) columns from IASI satellite observations. Two datasets using different input data for the retrieval are described: one is based on the operationally provided EUMETSAT Level 2 (ANNI-NH3-v2.1), and the other uses the ECMWF ERA-Interim data (ANNI-NH3-v2.1R-I). Analyses illustrate well that the (meteorological) input data can have a large impact on the retrieved NH3 columns.